Overall the ottoman is fine. Def seems a bit larger online so was little bummed when I received. Seems well built enough, especially for the price. Easy enough to install the feet and slap on a few felt pads to protect the floor and good to go. Perfect as a bed end bench for your bedroom or as an accent piece in your living space, the Alcmene storage ottoman bench combines handy seating and storage in a stylish way. Constructed of solid rubberwood frame, the storage ottoman bench features cushioned seat upholstered in quality polyester blend fabric that's durable and stain-resistant, available in your choice of beige, greyish beige, dark grey or light blue color for a neutral or statement look. Featuring grid-tufting design, the hinged top reveals spacious storage trunk while the black solid wood legs create a strong foundation and an elegant look. Made in Malaysia, the Alcmene storage ottoman requires minor legs assembly. Perfect storage bench for extra storage. It matches my Baxton storage bed perfectly!! Awesome product and highly recommend it. Great quality as well. We are very happy with our purchase! 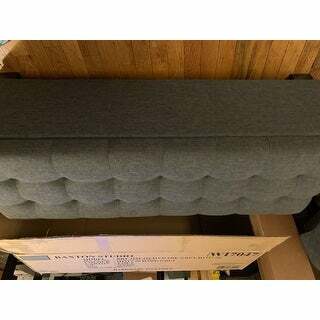 The storage ottoman was delivered quickly and matches well with our sectional couch. Quality is very good. The only assembly needed was putting on the four legs which was very easy. Before buying we shopped around and didn’t find anything even close to the value Overstock.com offered. A solid 5 stars. Sturdy and nicely made. This bench/ ottoman goes perfectly at the end of our bed. It looks polished now. This looks like others I’ve seen for much more $. The bench looks great, and was a great price. However, the grey color has almost a navy hue to it. I was expecting more of a charcoal color based on photos. It ended up working in the room, but it wasn’t what I expected. bought this for my bedroom, great quality and heavy duty! great storage for extra blankets and quilts. Looks just like the photos. It is holding up pretty well after almost a year with only slight pilling on the top where our feet rest. Not super cushy on the top but about what you'd expect looking at it. Super good quality and price! Came fully assembled except for the 4 stand which is easy screw on. Match our upholstered dark grey bed frame perfectly. Would definitely recommend buying!! This storage ottoman is well made and sturdy. It was easy to put the legs on. There was a strong chemical smell when I opened the lid but I sprayed Biokleen inside and aired it out. 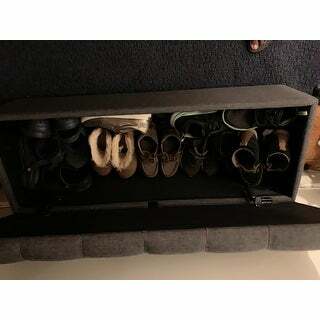 I bought this for storing shoes in the entry. It looks great and makes the hall look much neater. Great Buy!! This bench is very attractive at the foot of my son's bed, and it's a workhorse- it serves as seating and storage. We use it in place of a footboard, and it's been a great fit. It’s small but sturdy and basic install with the “feet.” I holds a lot of toys for being a small ottoman. I am very pleased and would recommend. I also really like the color. Great quality, lots of storage space. Using at end of bed for extra storage. Delivered quickly and looks just like pictured. Would have preferred taller fees on the bench. But very pretty. So easy to “put together” as you literally put the little feet on it. It’s a great addition to our bedroom and a really nice deep gray that matches our headboard very well. Good price!! "How much weight does this hold if using as a bench?" The weight capacity is 250 pounds. It was the color,fabric and dimension I was looking for. It will be perfect for my daughters room. It is what I need for my bedroom. For the size and color and style. Unfortunately we do not have any samples or swatches available.